Now that Insect Media is out, I am organizing a couple of events sort of as book launches—with a little help from my friends! One takes place in Berlin, at the Generalpublic.de cultural venue on Schönhauser Allee 167c ( 10435 Berlin) on March 4, Friday, 7 pm – Shintaro Miyazaki will be interviewing me , and hopefully with drinks and nibbles (there has been talk of some Japanese finger food!). Also the book is on sale there, with a small launch discount. Even before that, in Cambridge, we are organizing a joint event with Joss Hands whose own book @ is for Activism came out in December as well! This takes place February 22, Tuesday, 5 pm at Anglia Ruskin University at 5 pm. The room will be Helmore 251. ‘New Directions in Media Studies: Questioning The Digital Turn’. 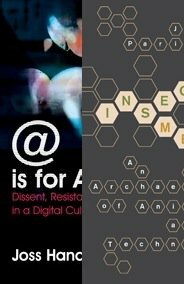 In their new books Anglia Ruskin lecturers Joss Hands (@ is for activism) and Jussi Parikka (Insect Media) address some of the pressing new issues in Media Studies emerging from the digital revolution in communication technology. This event will act as a book launch, but also offers the chance to address the relevancy of innovative cross disciplinary themes in contemporary Media Studies. Both books are characterized by distinct theoretical and political perspectives on issues such as the impact of digital networks on collective action, the ontology of politics, economic production, the ‘post-human’ subject and science-arts interdisciplinarity. Hands and Parikka will offer short introductions to key themes in their books and welcome questions and discussion over wine and nibbles. The event is sponsored by CoDE – Cultures of the Digital Economy research institute at Anglia Ruskin, and the campus bookshop John Smith’s is offering both books to be purchased during the event.